NEWARK, CA--(Marketwired - Dec 4, 2013) - Morpho (Safran), through its subsidiary Morpho Detection, Inc., today announced it has received a five-year indefinite delivery/indefinite quantity (IDIQ) contract from the Transportation Security Administration (TSA) for its reduced-size CTX 5800™ explosives detection system (EDS) with a maximum value of $133 million. Under terms of the contract, Morpho will supply stand-alone CTX 5800 EDS as well as ancillary equipment and other services as needed. The first delivery order for two CTX 5800 units will be delivered to TSA in early 2014. 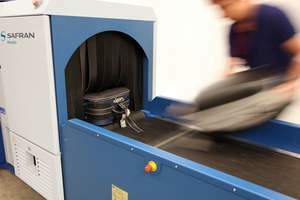 "Morpho Detection is thrilled to supply TSA with their first order of the advanced CTX 5800 explosives detection system," said Karen Bomba, president and CEO, Morpho Detection, Inc. "By leveraging advanced imaging technologies in a smaller and lighter solution, CTX 5800 is delivering on Morpho's commitment to help airports of all sizes realize the operational and security benefits of an automated checked baggage screening program." CTX 5800 utilizes advanced Computed Tomography (CT) technology to help airport operators plan for evolving threats and future expansion. In addition to stand-alone, CTX 5800 is available in a mini-inline or integrated medium-speed configuration to help airports meet growing operational requirements and future security mandates. CTX 5800 is certified by TSA and approved by European Civil Aviation Conference (ECAC) as meeting European Union Standard 3 requirements. Morpho Detection, Inc., part of Morpho, Safran's (PAR: SAF) security business, is a leading supplier of explosives and narcotics and chemical, radiological, and nuclear detection systems for government, military, air and ground transportation, first responder, critical infrastructure and other high-risk organizations. Morpho Detection integrates computed tomography, Raman spectroscopy, trace (ITMS™), mass spectrometry, X-ray and X-ray Diffraction technologies into solutions that can make security activities more accurate, productive and efficient. Morpho Detection's solutions are deployed to help protect people and property the world over. About this company Morpho Detection, Inc.